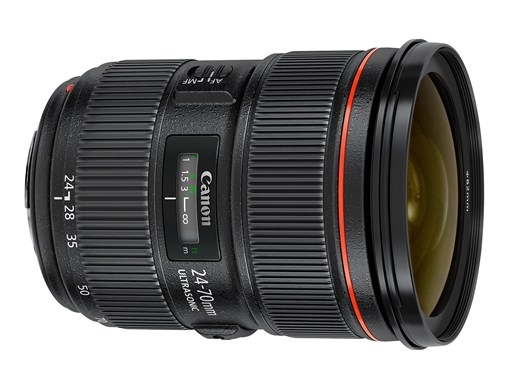 "Canon has released three EF lenses, including an updated 24-70mm F2.8 II USM. The latest version features what is promised to be a more durable body, despite being a little smaller. In addition to this high-end full-frame standard zoom, there are completely redesigned semi-fast 24mm and 28mm F2.8 primes, both of which feature USM focus motors and image stabilization." Canon has updated three lenses, including a highly popular one, and leaves me slightly confused. For some strange reason Canon has seen it fit to add IS to light wide angle primes, but thinks the heavier 24-70 with a telephoto end needs it less (which in my opinion, does not). Sometimes you wonder what the camera companies are thinking. In any case, the 24-70/2.8 L II is a new lens, and not just minor update to the previous 24-70/2.8 L. It promises better image quality, and better physical durability. The 24/2.8 and 28/2.8 have small wideangle primes, but now come with IS (which I still find utterly weird), and newly designed optics. No word on pricing or availability.